FROSH DECRIES PURPLE LINE DELAY: Maryland’s top lawyer this week told a federal judge that delaying Purple Line construction to analyze how Metro’s recent woes may affect the light-rail system’s ridership “would be profoundly disruptive and could jeopardize” the project, reports Aaron Kraut for Bethesda Beat. CYBER-PANEL RECOMMENDS DEFENSE TEAM: A panel charged with assessing Maryland’s vulnerability to cyberattacks recommended Friday that the state create a team of emergency personnel charged with defending its networks against hackers, writes Ian Duncan for the Sun. The General Assembly created the Maryland Cybersecurity Council last year and asked for regular reports with ideas for how to better protect the state’s computers and other critical infrastructure connected to the internet. ED DEPT PROBLEMS: Following a MarylandReporter.com story, Josh Hicks of the Post reports that the Department of Education needs to better enforce its safeguards against child-care workers who could put children at risk, according to a report this week from state auditors. A review by the Department of Legislative Services found that the state has failed sometimes in recent years to ensure that child-care employees had background checks and that authorities followed up on criminal alerts for such individuals. STATE LEADS IN NIH FUNDING: Maryland is a leader in National Institutes of Health funding for biomedical research and in venture capital investment for bioscience-related companies, according to a recent study from the Biotechnology Innovation Organization. Brandi Bottalico of the Frederick News Post writes that the bioscience industry employs more than 34,000 people in Maryland, and the average annual wage for a bioscience worker in the United States reached $94,543 in 2014, according to the report. HIGH COURT MAY REVIEW RULING ON REPRESSED MEMORY: Allegations of childhood sexual abuse from more than 30 years ago may result in Maryland’s top court reviewing its 1996 decision finding no legal significance between a repressed memory of a traumatic event and mere forgetfulness, Steve Lash reports in the Daily Record. 2nd CABINET MEMBER LEAVES: A member of Gov. Larry Hogan’s cabinet has left the administration for a private sector job. The governor’s office announced Friday that Gail Bassette, secretary of the Department of General Services, had resigned to take a “senior executive” position, the Sun is reporting. HOGAN’S PHONY STORY LINE: Political commentator Barry Rascovar, writing in MarylandReporter.com, says Gov. Larry Hogan Jr. keeps promoting a phony story line to justify attacking Democratic lawmakers and scaring local officials into believing vital road projects are in grave jeopardy. If that’s the case, why hasn’t the governor named those highway construction projects that are on the “kill list” because of those evil Democrats in the Maryland General Assembly? That’s water from the sprinkler system on the State House dome after the lightning hit, not smoke. Photo from Governor’s Facebook page. 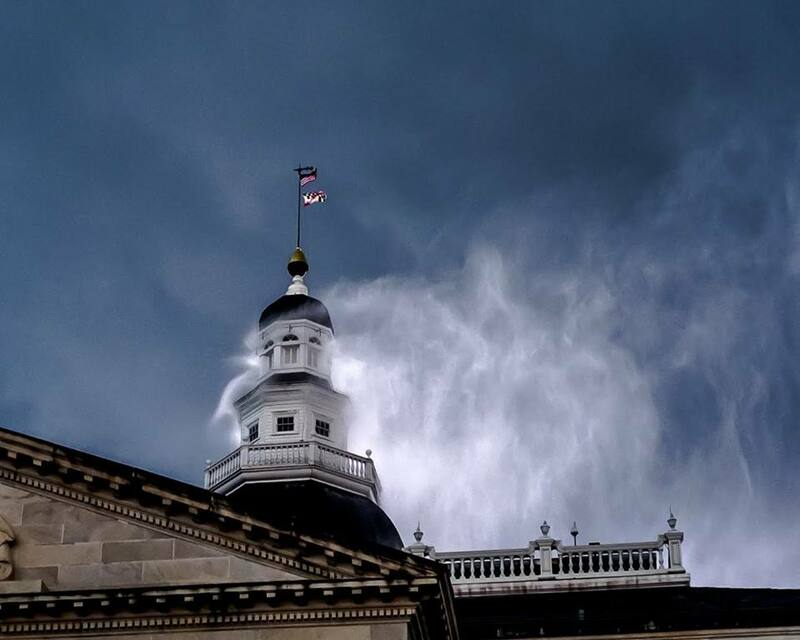 STATEHOUSE STRUCK BY LIGHTNING: Luke Broadwater of the Sun writes that Maryland’s State House in Annapolis was struck by lightning shortly after 6 p.m. Friday, the governor’s office said. Doug Mayer, a spokesman for Gov. Larry Hogan, said firefighters were on the scene assessing the damage, but there was no active fire. HOTEL FINED FOR NEST REMOVAL: The Maryland Coastal Bays Program says 14 migratory bird nests that included 40 gull eggs were illegally removed from a hotel in Ocean City, and hotel officials have been fined $450, according to an AP report in the Daily Record. NEIGHBORHOOD BY NEIGHBORHOOD: In an extensive, multipart and indepth report, the staff of the City Paper looks at demographic and statistical maps of Baltimore City to come to some surprising and not-so-surprising conclusions about race, money, health care and who benefits from government intervention. MO CO BAG TAX RESULTS: Like most local governments, Montgomery County is perennially looking for ways to generate revenue. When it imposed a 5-cent levy on disposable shopping bags in 2012, however, officials said the intent was to change behavior, not to squeeze more pennies from taxpayers. Four years later, county data that tracks the impact of the bag tax offers conflicting evidence about whether it is having the desired effect, reports Bill Turque for the Post.